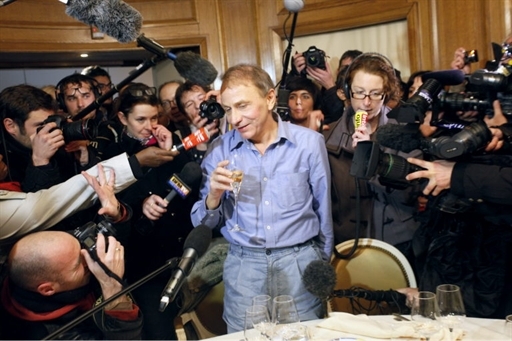 Michel Houellebecq finally wins the Goncourt! Not because of his incredible consumption of cigarettes or because of drinking too much cheap Argentinian wine. There were no drugs at play neither. Only words. In his last novel La carte et le territoire (The map and the territory) in which he himself has a minor part because the novel features a badly dressed, drunken writer by the name of Michel Houellebecq, the author has himself murdered in quite an atrocious way: The body of the writer is chopped to pieces, the strips of his flesh are arranged like a painting of Jackson Pollock. Only his head is saved. Houellebecq got decapitated and his head stands there together with the one of his big, black dog. Yes, Houellebecq finally made it. He got the Goncourt: Michel Houellebecq was awarded the prestigious Goncourt literary prize today for his latest and certainly best novel The map and the territory. Michel Houellebecq is dead! Vive Michel Houellebecq! A miracle? Yes. Houellebecq actually has been passed over several times for the prize. Most French critics just hate him. One of them once wrote that the Goncourt judges handle his works “with their fingertips, fearful of dirtying their hands”, but for the first time the general consensus was that he would win. Does he deserve the award? Absolutely. And more than anybody else. Why? Because his oeuvre is one of the strongest and most radical in French contemporary literature. His descriptions of sexual and general alienation might often be crude. But there is nobody else who reflects French society with more accuracy than he does. People hate him, because they are looking to shoot the messenger. Houellebecq is a prophet. He has a sixth sense. He was writing about cloning long before the newspapers did. He made explode a bomb in a nightclub in Thailand and called Islam “the stupidest religion”, when some days later the twin towers came down and with them all the convictions and believes of the past 20th century. But you needed only to look in his eyes, to understand. Houellebecq wanted this award desperately. He wanted the recognition of the literary milieu he disdains; he wanted to be dubbed a knight by the critics who hate him. Because deep inside he has a romantic soul. He is looking for reconciliation. Provocation, in his case, is only the dreamer’s mask.